Welcome to our Spread The Love Blog Hop! Today we are featuring a very special stamp, True Love, that is available ONLY through July 31st! What is so special about this stamp set? Not only is it adorable but when you purchase this stamp, Close To My Heart will donate $7 to Operation Smile! Since its founding in 1982, Operation Smile has performed over 220,000 surgical procedures to correct facial deformities in children. It only takes an hour for volunteer medical teams to perform these life-altering surgeries that will give children confidence for a lifetime. If you came here from Jen Rubio's blog, you are on the right track! Just look for the link at the bottom of my post that will take you to the next blog! The hop is one big circle so when you come back to me, you will know you have visited all of the blogs! If you get lost along the way you can check the list HERE. I wanted to use this month's feature paper, Swan Lake, for my card so I matched the colors on the little girl's dress and heart with the colors in Swan Lake using my ShinHan Touch Twin Markers and my CTMH Marker Color Chart I embossed a piece of Glacier Cardstock with the new folder - Happy Thoughts and sanded the words "BE HAPPY" so that it would show up more in the background. I cut extra hearts with the Flower Market Cricut cartridge and stamped them in Poppy and Peacock ink. The ribbon is from the Rustic Home Ribbon Pack. Purchase the True Love stamp. 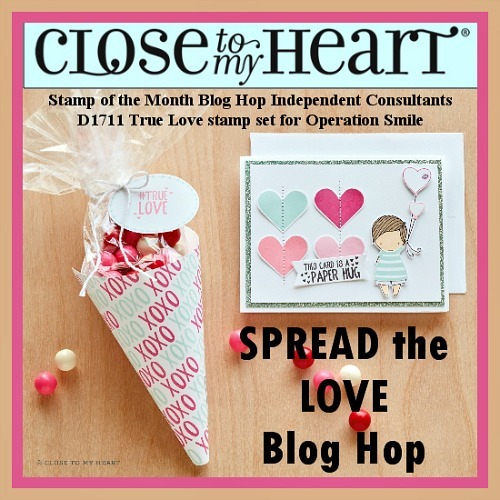 Close To My Heart will donate $7 for each True Love stamp set sold! This stamp is only available to purchase through July 31, 2017! When you purchase ANY My Acrylix stamp set, a portion of each stamp is donated to Operation Smile. Round Up! Any time you make a purchase with Close To My Heart you can 'round up' your total to the nearest dollar! This 'round up' amount will be donated to Operation Smile. 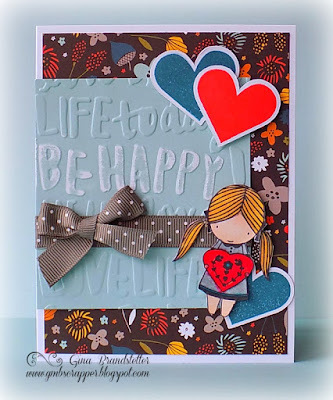 You are now ready to hop over to Tracey Pierce's blog to see what she has created! Love this card! So bright and beautiful! Lovely with the accent of Swan Lake! Love the way you accented the words be happy by sanding them.